This comprehensive one day EFR – Emergency First Response course is a pre-requisite for the PADI Rescue Diver course. Although it can be completed earlier in your training and is also available to non-divers. It provides a thorough insight into Emergency Primary and Secondary Care. Therefore this is a thoroughly worthwhile course! It will have you learning and practicing essential skills, then putting it all into action with a few fun staged scenarios. 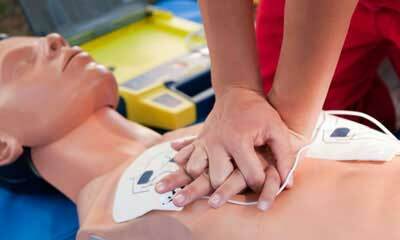 EFR Primary Care (CPR) will teach you how to respond to life-threatening emergencies. The course focuses on primary care through a combination of knowledge development, skill development and realistic scenario practice. In that way you will gain the confidence in ability to provide care when emergency situations arise. Regardless of it being diving or not. Scene Assessment, Barrier Use, Primary Assessment, Cardiopulmonary Resuscitation (CPR), Serious Bleeding Management, Shock Management, Spinal Injury Management, Conscious and Unconscious Choking Management and Emergency Oxygen Use. EFR Secondary Care (first aid) covers injuries or illnesses that are not immediately life threatening. You will focus on secondary assessment and first aid through knowledge development, skill development and realistic scenario practice. I have been diving with Big Fish for quite a few times and i always love to come back. They got a great boat, good equipment and awesome guides/instructors. As the shop isn´t big, it also feels like family. The people take good care of you not just under water, but also on land. Andrea the shop manager was very helpful when it comes to finding places to eat or hang ot. The diving around Nusa Lembongan is one of the best i have seen so far and easy reachable from Bali, as it takes just half an hour with the speedboat from Sanur.